This week marks a small milestone in Lu’s Breast Cancer treatment as she reaches the halfway point in her chemotherapy regime. To date everything has gone to plan with no unexpected hiccups. It is however a little surreal knowing that your son was receiving treatment for his cancer in the same room only a few years ago. 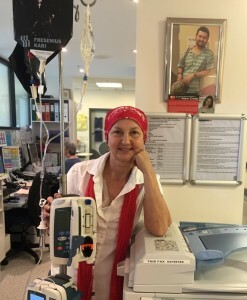 Pictured is Lu underneath Adem’s picture, which hangs proudly in the Oncology Outpatients Unit. We have no doubt that Adem is watching over his mum and the other patients receiving treatment and know that his inspiration & strength is a help to many.